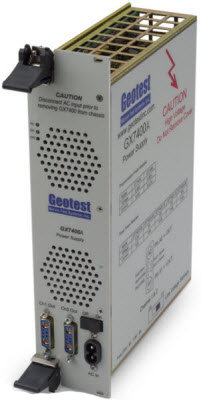 The GX7400A is a dual output programmable DC power supply designed for use in 6U PXI systems. The GX7400A occupies three slots and is controlled via the PXI bus. The AC power is provided using a panel-mounted receptacle. The power supplies are fully isolated and can be externally connected in series to provide higher voltage. The GX7400A can accommodate two programmable power modules. The power section is optically isolated from the PXI bus and the outputs are isolated from each other. A 14-bit DAC and a 16-bit A/D provide extremely accurate programming and readback capabilities. Input AC power is supplied by 120 VAC or 240 VAC and is auto-selectable - providing world-wide power compatibility and flexibility. The GX7400A is supplied with a software package that includes a virtual panel, driver, and on-line documentation. The virtual panel can be used to interactively control the instrument from a window that displays the instrument’s current settings and allows you to control and change them. The driver includes a library of functions that is used to control and change the instrument settings from within your application and is compatible with the Windows operating system (32 bit DLL). In addition to the driver library, various interface files provide access to the library from your favorite programming tools and languages. These interface files support ATEasy, C/C++, Microsoft Visual Basic, Delphi and other application development environments.